Identifying what motivates you at work can help you choose the career you are best suited to. Find out what career motivators tests are, what questions they include and how to successfully pass one. 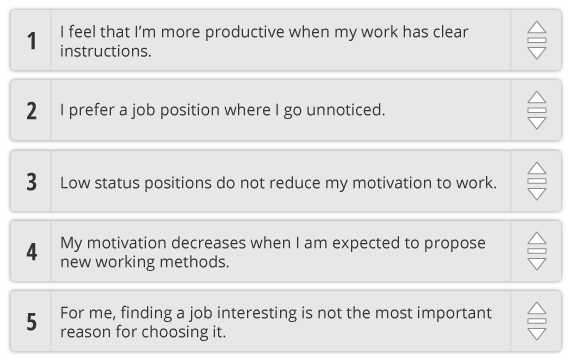 What Are Career Motivators Tests? Career motivators tests, also known as career motivation tests, are a type of psychometric assessment, designed to determine a user’s internal and external motives at work and to help them gain an understanding of the direction their career should take. Many employers often use these tests in their preliminary selection process to identify whether an applicant is a great fit to the company. This essentially helps companies hire the right people. These tests can be taken separately or as part of a series of tests to ensure a more accurate analysis. For example, the Career Hunter Career Motivators Test is designed to be taken alongside 5 other tests: Career Interests , Work Personality, Abstract Reasoning, Numerical Reasoning and Verbal Reasoning. Upon completing all 6 tests that make up the Career Hunter platform, users are given a 55+ page personalised report detailing their overall result and also provided with the top 10 careers they are best suited to. Meanwhile, don’t forget to check out our sister site CareerAddict’s quick guide on career motivation tests! In the example below, the user has indicated that, of the five statements, they agree the most with the first statement while they agree the least with the last. Drag and drop each statement to the appropriate position - the statement which describes the activity that is most important to you should be placed in the top position. Remember, there are no right or wrong answers in career motivators tests. It is essential that you answer questions based on what is applicable to you. Try to answer questions as truthfully, and as faithfully to your internal and external motives, as possible. Avoid answering questions according to what you perceive to be ideal or what you believe is expected of you. Doing so will negatively affect your overall result. Career motivators tests shouldn’t be relied on for some magical answer. Having said that, however, it’s important that you remain open to any indications of career motivation that you never considered before. Although easier said than done, do not let stress get the better of you. Do not overthink your answers or hastily answer questions. Ready to find your ideal career? Start building your career profile with our free Career Interests test, and discover your internal and external motivations!